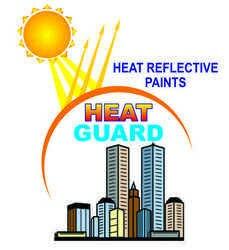 Heat Reflective paint or Heat reflective coating contains highest quality of Resins combined with insulating and reflective fillers. It is a bright white elastomeric coating having high reflectivity to sun rays, hence keeping Interiors cool during hot summer months. It is suitable for use on all types of horizontal and vertical surfaces. Water based and ecofriendly coating. It is called as Heat Guard. Reflects and reduce the Heat of sun rays. UV protection characteristic. Keeps interiors cool-lesser energy costs. Greatly reduces thermal load on the surface. Waterproofs masonry surface. Good adhesion to almost all surfaces like Concrete, Tin sheet, A.C.sheets etc. High temperature resistance will not crack, peel or spall. Prevents growth of fungus, algae, mildew etc. Single component easy to use. Open the container and stir well. Apply by brush, roller or spray. Apply two or three coats. Maintain a minimum interval of 4-6 hours between successive coats. Depends on the nature of the surface and number of coats. 10-12 sq/mtr/coat on smooth surface. Clean the surface to remove dirt, loose particles, flaking paint, etc. In case of steel surfaces, remove all scales, rust and grease. Examine the surface closely for any cracks or openings. Fill cracks with Crack Filling Material. Skin contact: Wash immediately with soap and water thoroughly. Wash immediately under running water.